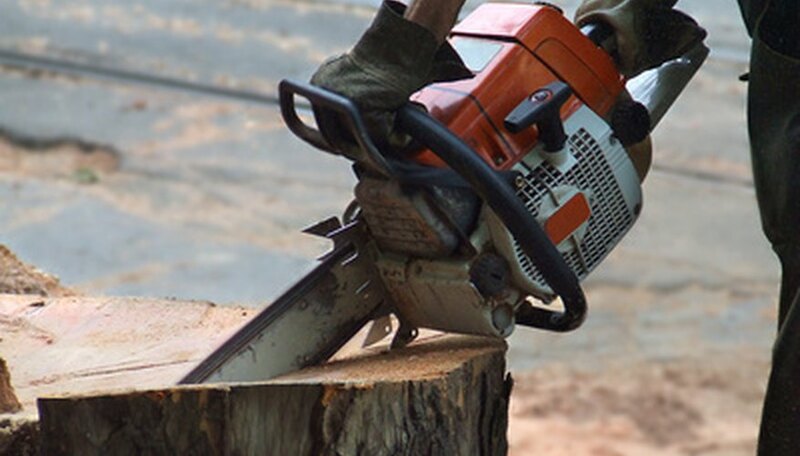 Poulan and PoulanPro products range from simple edgers to industrial-strength chainsaws. The Poulan lineup of chainsaws includes 10-inch to 20-inch chainsaws. Users can locate manuals and information on a majority of Poulan products, but the 3800 Poulan Chainsaw poses some difficulties. Manufactured in 1987, this chainsaw was manufactured by Poulan under the Electrolux name. A parts listing for the device is found online (see References). The 3800 weighs 17.4 lbs. with a 20-inch bar and chain. The device has no chain-brake and has a anti-vibration handlebar system. It is constructed of die-cast magnesium and accommodates 16-inch to 20-inch bars and chain. The one-cylinder engine has 3.7 cubic inch displacement, piston-ported intake with a flocked wire-screen air filter and a centrifugal clutch. Replacement spark plugs are Champion CJ8Y or RCJ8Y gapped at .025 inches and use a 40:1 fuel-to-oil ratio with standard grade fuel and Poulan Mix oil being used. The oil pump is automatic with a manual override. The carburetor is Walbro HDB-8 series. The chainsaw has an automatic rewind starter and holds 19 fluid oz. of fuel. The crankshaft main bearings are caged needle roller. The flywheel and coil air gap is 0.010 to 0.014 inches. The device has fixed ignition timing.